Last month the Westonbirt School Equestrian Team took part in two National Schools Equestrian Association competitions at Stonar and West Wilts Equestrian Centre, near Melksham. The team attended the one-day N.S.E.A event at Stonar where the 75cm team (Gemma, Jasmin, Issy, Caitlin) were placed fifth. One of the girls was also placed 8th individually in the same class. Another of the girls secured a forth equal place in the individual 90cm class. All the results were a fantastic achievement as there was huge competition from schools from all over the country. The team then headed for an N.S.E.A show jumping qualifier at the West Wilts Equestrian Centre, near Melksham at the end of the month. Here they rode with determination and won the 85cm team qualifier, came 6th on the 75cm and had an individual placing in the 90cm class. 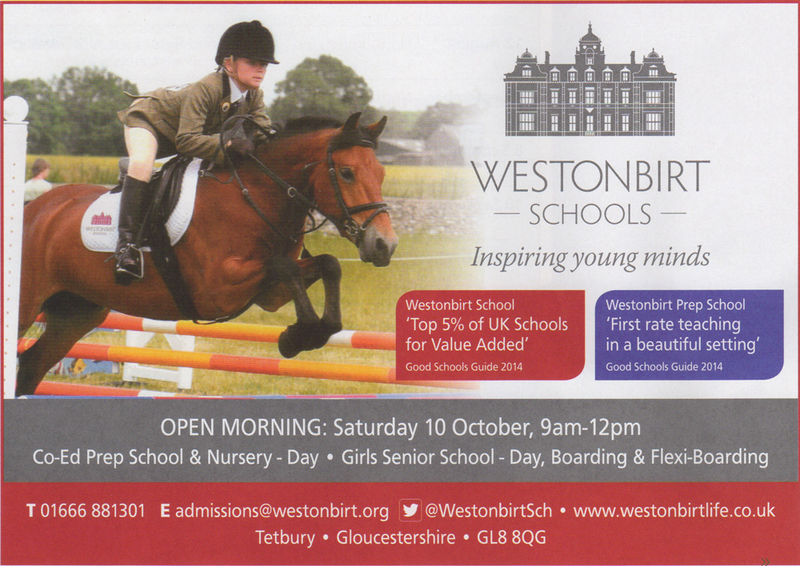 Their win has secured The Westonbirt Equestrian Team with a place at the N.S.E.A Championships at Addington in October.